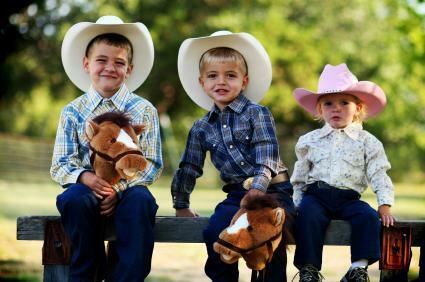 Little wranglers of all ages are sure to enjoy a cowboy-themed birthday party. 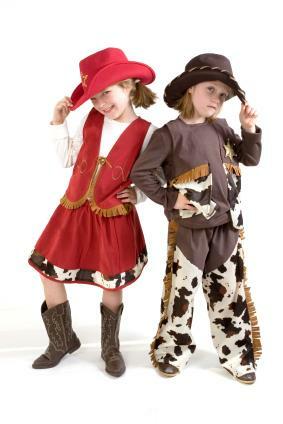 Both boys and girls can kick up their boots at a western party featuring a variety of fun and festive activities. The invitation is often the first notice that guests will get of the upcoming party. 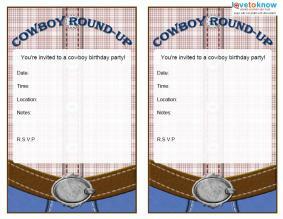 The invitation will set the theme and make guests aware of your fun cowboy party theme. Download a cowboy party invitation. Purchase premade invitations at a party supply store or on a site such as Oriental Trading. Print ones using a free printable template. If you need help downloading the template, check out these helpful tips. Make your own. To make your own, you can simply write a catchy phrase such as "Cowboy Round-Up" or "Most Wanted" and add a picture of your child in a cowboy hat, or an image of a horse or other western theme. You can also cut paper into the shape of a cowboy boot or hat and use that for the invitation. Be sure to note the details of the party such as the date, time and location as well as any special considerations such as having each child wear jeans, a flannel shirt, or a white tee to keep with the theme. You can add a cute note such as "Cowboy boots are optional." Banners that say "Happy Birthday Cowboy" (or Cowgirl) and "Welcome to the Wild West"
If the party is for girls, consider using girly western items such as pink cowboy hats and pink bandanas. Pink and brown streamers and balloons can add a cute touch to the party decorations. The cake can be decorated in a western theme with designs such as a sheriff's star, cowboy boot or hat. The cake will not only serve as dessert, but can also be a centerpiece on the buffet table. 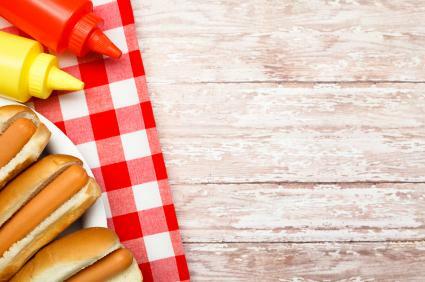 Serve the food on a picnic table and use plastic utensils in red or blue. Consider using a straw cowboy hat lined with a red napkin to hold the chips or purchase inexpensive pails to hold items. Red bandanas make perfect napkins and will look great with the decorations. No party is complete without a fun mix of games and activities. During this time, you can play country music in the background to add to the overall theme. Consider children bandanas and straw hats to wear for the games so they feel like cowboys and cowgirls. Set up a plastic horseshoe set on the lawn and give each child several chances to get the horseshoe around the stake. You can also award points to whoever gets the horseshoe the closest to the stake, if it is difficult to get it to land on the target. Create an obstacle course for the kids to navigate through. If possible, purchase stick horses for them to use for this game. Some fun obstacles include rows of cones, inner tubes, and hula hoops to step through. You can divide the kids into two teams and have them take turns going through the course. When one finishes, they hand the stick horse to the next. Whatever team finishes the race first is the winner. Spray paint small rocks with gold metallic paint. Use a large tub or baby pool and fill it up with sand and water. Scatter the rocks into the tub or pool to hide them in the sand. Give each child a plastic sand sifter and see who can sift out the most gold. Cover a table with plain white paper and fill up small pails with crayons. Print off pictures of horses and other western images and give each child a picture to color. You could also find Toy Story coloring book or a printable coloring page that features Woody and Jessie and use that as well, if your child wants a Disney element to the western party. Create small goodie bags with a western theme for each child to take home. You can fill the bags with items such as horse stickers, plastic sheriff badges, trail mix, and plastic horse toys. Tie off each favor bag with a ribbon or twine. A cowboy party is a fun theme for a birthday. Kids are sure to enjoy a mix of fun activities and games, as well as good food and the company of their friends, as they are surrounded by elements from the Old West.